I recently had to take a sick day from work. Isabella came down with a stomach bug, and it was gross and sad. Poor little thing didn’t know what was happening, she just wanted to sleep but just couldn’t at first. So this momma stayed home! In the morning, all she wanted to do was snuggle! I was happy to oblige, but I also knew I would eventually want to eat. So before my husband went to work, CROCK POT TO THE RESCUE! Chicken & noodles are good at any time, but the dish is a necessity on sick days. This recipe is being added to my list of “keepers.” It is super easy, delicious, and makes a ton so you will have plenty for leftovers! 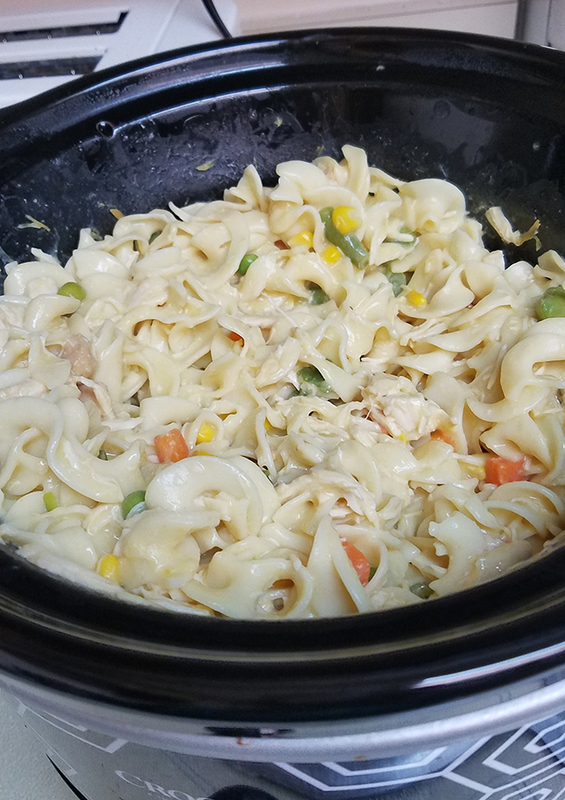 And I just love easy crock pot meals! I am trying to be better about meal planning and I recently used Kroger ClickList to help with that organization. If you haven’t used that, or something similar it is such a time saver! Being able to just build your list online, have someone else get it for you, and then pick it up, is AMAZING. I am not sure if I will ever step into Kroger again, haha! So check if your local grocery store does something similar! Tip 1: If you have large pieces of chicken, I would slice it up. That will make it easier when you go to shred it. Tip 2: 1 stick of butter = 8 tablespoons. I don’t know about you, but I don’t purchase sticks of butter, I get the tub. So I had to look up this bit of info! Tip 3: Kroger didn’t have the frozen egg noodles in stock. So I cooked them ahead of time and then put them in the freezer while everything cooked. I am not sure how important it is that they are frozen. I am sure it would be ok with just freshly cooked noodles; maybe put them in just a half hour before so they don’t get too mushy. 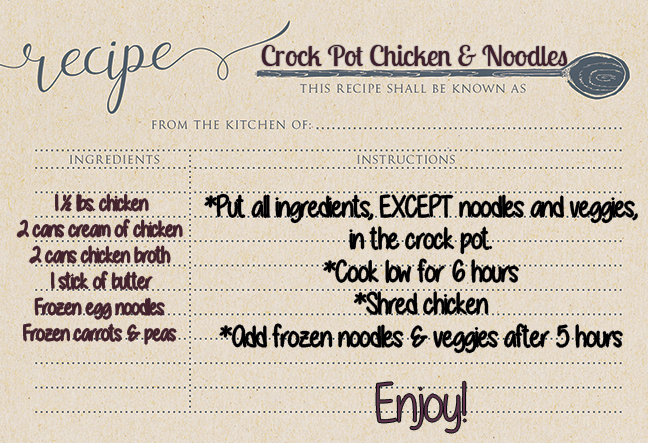 Tip 4: Shred the chicken before you put the noodles and veggies in. I wasn’t thinking and poured in the noddles, and then was digging out the chicken. Ugh. Tip 5: Veggies are totally optional! I included them because we need to be better about eating veggies if we want Isabella to eat them too! I got a little too excited and used the whole bag of egg noodles, so we will be having chicken and noodles for days! Hahah! I think Isabella would really like this as well. At the very least she would pick out and eat the corn and carrots! But little lady was just on Cheerios and Pedialyte for the day. Poor thing. But Cheerios are pretty much her fave, so I am sure she wasn’t too upset! Someone please hold me accountable on freezing these leftovers! I always say that I will do that and never do. I don’t want to be wasteful! After a rough night and getting a little bit of sleep, the day started out well! Kids are so resilient! They honestly have such a good outlook on things and they don’t even know it. How often do we let something minor sit with us all day and effect our mood? Kids just want to play and be loved. We can definitely learn a few things from our little ones! We all need to dig down and find that inner kid! Spread kindness, smiles, cheer, and always look for the silver lining! What is your “go-to” meal when you are feeling under the weather? Easy Ways to Have Romance All Year Long!